While in Christchurch on Monday I popped into KRD Imports' warehouse to check out some new bits and pieces and to just say hi. I was armed only with my phone but I snapped a couple of pics of these two products that caught my eye. 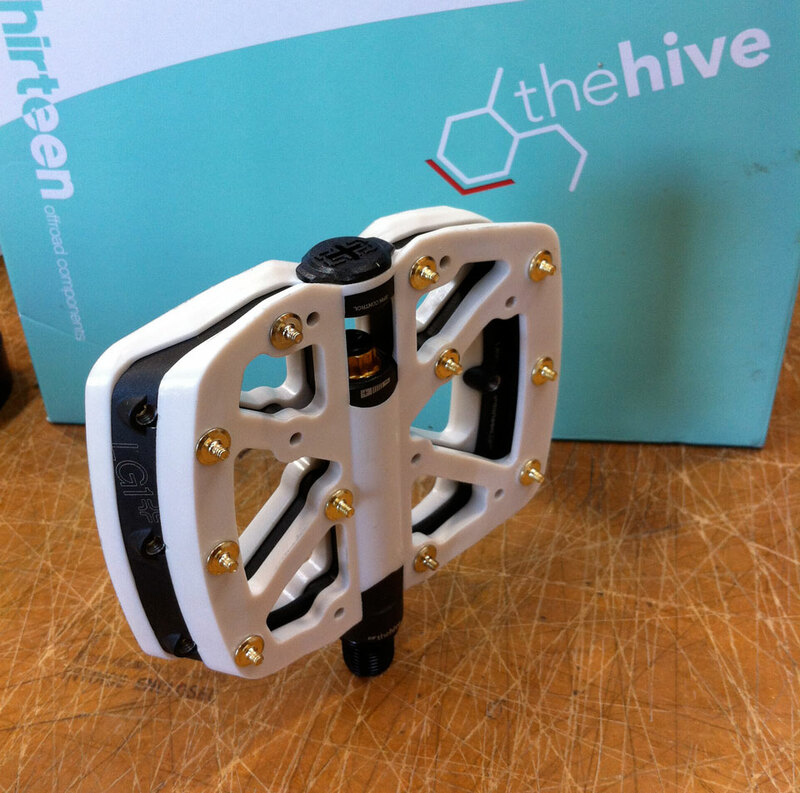 KRD have been doing E13 since the brand started but since the collaboration with The Hive a couple of years ago both brands have been really stepping up their games and the new LG1+ pedal is just the tip of the iceberg. Some of you may remember spy photos that have been around for the last couple of years showing off this pedal under the name Staccato. Well it's finally here! It's now called the LG1+ (the LG1 series is designed for downhill and gravity). A set of LG1+ pedals weighs in at 468grams and as with all Hive/E13 products that's where the similarities with other pedals end. The alloy (or Exalite) axle is sandwiched between two layers of impact resistant plastic (these are both replaceable), a torx nut on the end of the spindle controls pedal spin and they feature fully sealed self-lubricating bearings. Out of the box you get 4mm and 7mm pins that provide ample grip for shoes as well as shins and calves. RRP on these guys is NZD$220. Newer to the KRD stable of brands are X Fusion Shox. X Fusion have been around for the last couple of years and have amassed a tonne of knowledge from making other people's suspension and also from their strong team of pro riders. The range includes both air and coil rear shocks, air and coil forks and even a height adjustable seatpost. This bad boy is the 170mm travel Vengence R. It's the base model coil fork and features rebound adjust as well as burly 36mm stanchions and a tool-less Syntace 20mm axle. RRP is $899. There is also an HLR coil model that features high and low speed compression as well as rebound adjust and there are a bunch of air models as well which you can check out here. KRD Imports are shipping both these items now. To find your local dealer flick them an email here.